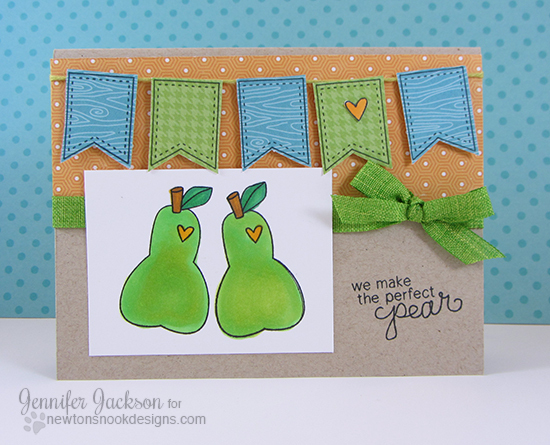 Newton's Nook Designs: Oranges and Pears that will make you smile! Today I'm popping in to share a couple more cards I created with the Sweet Summer Stamp Set! The first card features the pear image but I also used the cute little banner stamp to create a string of cute little flags across the top. I love how this looks on the patterned paper! Then I added a full bow, which I hardly ever do - since I'm not very good at tying bows - but I think this one turned out pretty good! This second card features the citrus slice with a fun bright orange and lime green color combo. I love the bright colors with the little bit of burlap - such a fun mix! Then I added the "wishing you a slice of happiness" sentiment. I love this sentiment because it could work for so many differentness occasions - birthday, anniversary, or just to say hello. One thing I don't like is that weird white hue on the peel - I think when I purchased my wink of stella glitter pen, I squeezed it too hard the first time and now it always dries with this funny hue - has that happened to anyone else? I'm guessing it's user error since everyone says how much they love theirs. Not sure if I broke mine? Both cards are so cute! I love the kraft color on the first one and your bow is fabulous! Really love the square of burlap on the second one :) I don't have a Wink of Stella pen so I'm no help there! Both are delightful cards with such fun color combinations! I especially like the burlap place mat behind the citrus fruit! Hi Jen, these are extremely sweet cards!!! As for the WoS, I have not ever seen a white opaque type color come from the Clear pen. I wonder if it might have reacted with the ink? I've used mine on every kind of color, but never saw any white, just sparkle.... I would send this pic to the company site and ask what it could be so we all could know. Thank you for sharing your lovely cards with us!!! These are both so cute!! Love the fun banner on the first card and the texture of the burlap on the second, and the wonderful, happy colors on both!! Oh my, Jen, you've created a delightful duo here! The banners with the pears, and the burlap with the oranges...incredibly innovative and creative! I agree with Rosy's comment: I, too, squished my WofS when I first used it, but it's been fine since. Perhaps yours has a design flaw. All the same though, your card is still fabulous!